Zerodha Sentinel is a new platform from Zerodha. In this Article, we will discuss in detail related to various features of Zerodha Sentinel, its subscription, set-up process, Zerodha Sentinel Pro version & more. Zerodha has recently launched a platform known as Sentinel, to help the traders, invest effectively and profitably. The Sentinel platform is a trigger notification software which provides notifications on any triggers added by the user in the Sentinel Platform. The name sentinel is taken as Italian word Sentinella is a guard or soldier who consistently keeps a watch on people. This platform also keeps watch on the market movements and provides notifications when certain conditions are met. This Sentinel Software allows the traders to set up various triggers based on the live market movements. This is a great tool for the traders and investors as it is very difficult to monitor and keep an eye on the market’s movement all the time. One can set different triggers based on the strategy he or she is following. When a particular condition is triggered, the notifications are sent instantaneously through the email. The notifications are also sent as Kite platform notifications. 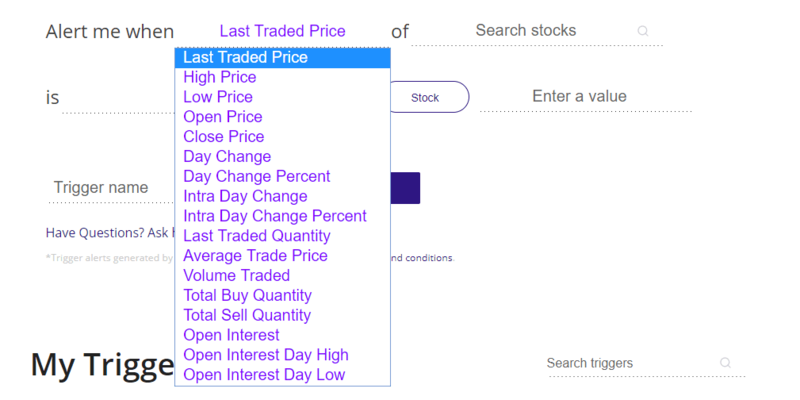 Multiple triggers can be set up by the traders in this platform. This facility is provided in both the free and paid versions. In the free version of Sentinel, about 30 different types of triggers can be set up. Advanced triggers can be set up in pro version of Sentinel. These triggers can be set up based on arithmetic expressions and performing some simple coding. Advanced triggers can be set up based on various functions and trading attributes. Sentinel is a highly secure platform as highly sophisticated measures are used to keep this software very secure. It is almost impossible for hackers to hack information from this web based platform. Sentinel Platform also comes with a Zerodha Sentinel Pro version, this is chargeable but provides more options in features. How to setup Zerodha Sentinel? The Zerodha Sentinel can be set up by login into Zerodha’s Sentinel Platform. If anyone has a Zerodha account, he/she can login to Sentinel using Zerodha Kites Account credentials. Once you login you will be asked few questions to set up a trigger. You can setup 30 Triggers monthly for free of 1 Data Point. 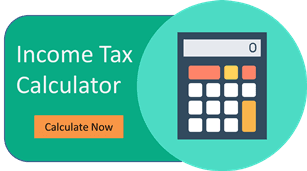 There are three types of Monthly, Half-Yearly or Yearly Subscription are available. As per your requirement you can buy a subscription or use it for free. 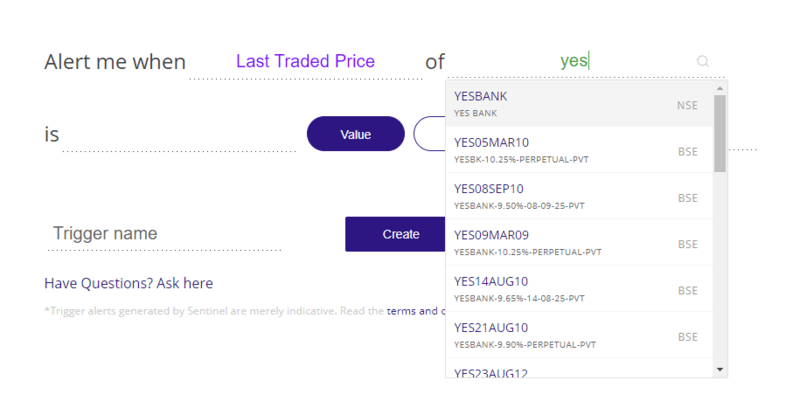 So this way you can easily set-up zerodha sentinel platform. How to Own Zerodha Sentinel? The Zerodha Sentinel is available in the free version as well as Sentinel Pro-version. The free version is with limited functionality and better features and capabilities are available in the Pro-Sentinel version. Advanced triggers can be placed in the pro version. The capability of Advanced Triggers is not available in the free version. A nominal charge must be paid to get access to the advanced pro-version of Sentinel. 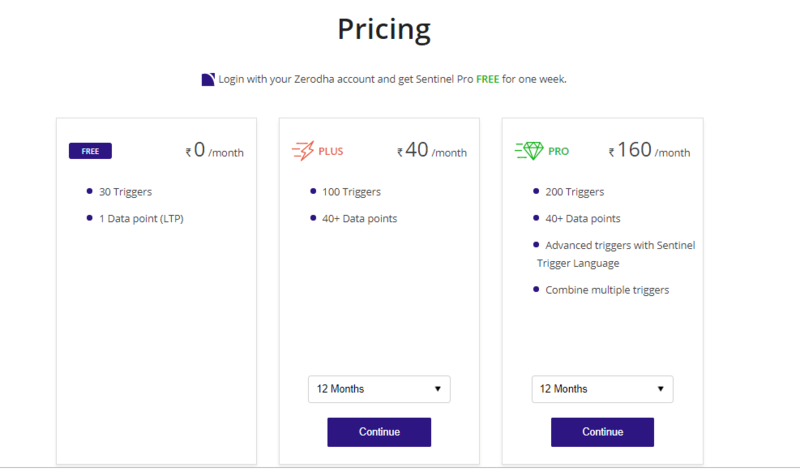 You can own a Zerodha Sentinel Plus Subscription for Rs.40/month & Zerodha Sentinel Pro Subscription for Rs.160/month. A New Zerodha user gets Zerodha Sentinel Pro for Free for 1st 7 Days. The customer service provided with this platform is excellent. The customer service professionals try their best to solve customer’s queries. The notifications are provided via 3 different source i.e. from Sentinel Web Platform, email and Kite App. For easy & accurate set-up of triggers very effective attributes like value and volume are provided. Sentinel Platform can be used for comparison aswell. The same stock can be compared with different attributes. Pro Version of Sentinel can be used to setup multiple triggers based on more than one condition. The platform shows the complete history of the triggers set and allied information. This is one of the best platform for improving the profitability of traders as well as investors. The Privacy and security are ascertained by a 24/7 support team. The platform has limited functionality. At present, it is only for seeing the notifications. The triggers are not pushed to the clients desktop or browser yet. The Sentinel Platform doesn’t have a App version yet. Once the condition of the trigger is reached, the triggers get deactivated. One has to activate the trigger manually for using it again. There can be some security concerns as well. This is because the internet is used for the operation of this platform, which can be insecure. Each trigger is required to be reactivated manually and separately. There should be an option of reactivating the triggers in a combined fashion. There are a lot of traders who trade in the financial market based on employing various strategies. Different positions need to be entered based on the meeting of various conditions. But, it is difficult to monitor the market movement at all the times and to be in the front of the trading terminals at the time of meeting up of conditions. To solve this problem, Zerodha has developed the Sentinel platform, which provides notifications at the triggering of various triggers. The notifications are provided in-app via Kite as well as through email. The productivity, as well as the profitability of the traders, can be improved by the use of Sentinel platform. More than 1 trigger can be set up by the use of this online platform. Thus, one can use this software and make their trading business a success.